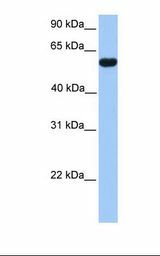 CUGBP2 antibody LS-C80313 is an unconjugated rabbit polyclonal antibody to CUGBP2 (CELF2) from human, mouse, rat and other species. Validated for WB. CELF2 / CUGBP2 antibody was raised against synthetic peptide located between aa112-161 of human CELF2 (O95319, NP_006552). Percent identity by BLAST analysis: Human, Chimpanzee, Gorilla, Orangutan, Gibbon, Monkey, Galago, Marmoset, Mouse, Rat, Elephant, Dog, Bovine, Bat, Rabbit, Horse, Opossum, Guinea pig, Turkey, Zebra finch, Chicken, Platypus, Xenopus, Zebrafish (100%); Lizard, Stickleback (92%). ELISA titer using peptide based assay: 1:62500. 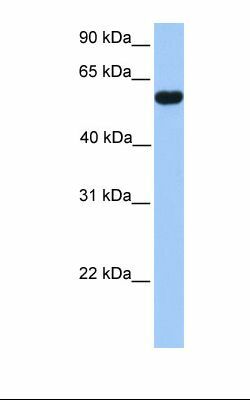 Western Blot: Suggested dilution at 1 ug/ml in 5% skim milk / PBS buffer, and HRP conjugated anti-Rabbit IgG should be diluted in 1:50000 - 100000 as second antibody. Placenta lysate. Antibody concentration: 1.0 ug/ml. Gel concentration: 12%. This image was taken for the unconjugated form of this product. Other forms have not been tested.